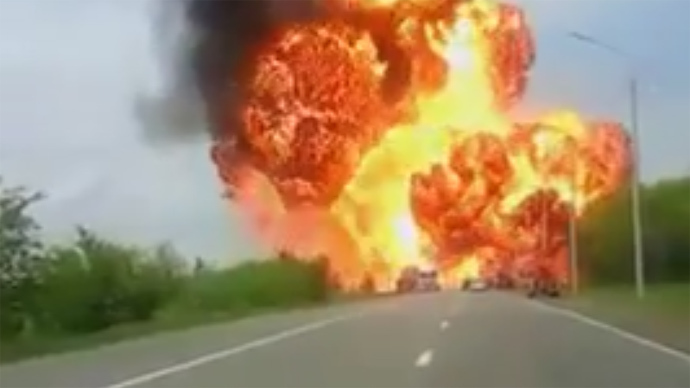 A striking video of a truck blast that injured at least one person in the south of Russia has emerged online. Explosive reagents - acrylic solvent contained in a big canister towed by a truck– caught fire and caused the blast. The fire started in the vehicle’s brake blocks. One man was injured in the explosion, the shockwave throwing him 10 meters. He also suffered from carbon monoxide poisoning. The man was in his yard nearby when the blast happened. Two businessmen from Turkey were in the vehicle, but they managed to unhook the trailer with the cargo in time to drive off and be at a safe distance. Emergency workers who dealt with the fire from the blast also presented to hospital for treatment for poisoning from combustible products. The truck was going from the town of Verkhny Lars in North Ossetia, to the Siberian city of Omsk.